The exhibition, curated by anthropology graduate student Anthonie Tumpag and co-sponsored by the Asian American Center, is located on the fourth floor in the Donn V. Hart Southeast Asia Collection display cases and runs through Friday, Oct. 31. Tumpag obtained these items and curated the exhibit to demonstrate cultural similarities between the people of Madagascar and various maritime peoples of Southeast Asia. Various waves of human migration emanating from Southeast Asia, Africa, the Middle East, India and the West has enriched the cultures of this island nation. 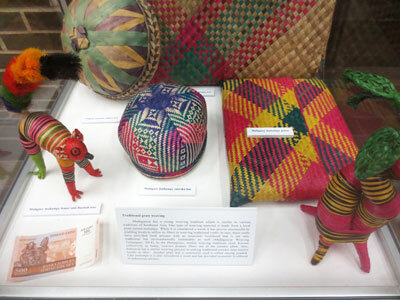 The majority of the exhibit’s artifacts highlight Madagascar’s relationship with Southeast Asia, which was established approximately 2,300 years ago when seafarers from Borneo landed on Madagascar. The exhibit also demonstrates the salience of indigenous belief systems toward ecological conservation efforts as a means to curb the rapid depletion of endemic flora and fauna presently occurring on the island and within other Southeast Asian nations. While the scientific community might be the most vocal proponents for ecological conservation, some scholars cite that indigenous communities and their cultures have some insight to share about the environment in which they live. Tumpag obtained the majority of the items in the display during the NIU Study Abroad program, “Madagascar Past and Present: Extinction, Biodiversity & Conservation,” led by Mitchell Irwin from the Department of Anthropology, as well as other professors from NIU, the University of Massachusetts and the Universite D’Antananarivo. For more information, call (815) 752-1177 or email Z1679073@students.niu.edu. For information regarding the non-governmental organization Sadabe, which is affiliated with this field school and has been working to address the human and ecological issues facing the Tsinjoarivo commune of Madagascar, visit www.Sadabe.org.